They are one of the most familiar flowering plants in the garden. Easy to grow and versatile, geraniums can be added to your flower bed, grown in containers, or placed in hanging baskets. They can even be used as indoor house plants. And if you need another reason to grow them, these beautiful flowering plants stay healthy-looking in the driest and hottest conditions. It’s no wonder they are always one of the top choices for low-maintenance gardens. Not only will geraniums delight you with their remarkable smell, but you’ll find them in almost any shade of red and pink that you can imagine. Follow these six growing tips and enjoy their fragrance and color throughout the season. Buy your seedlings from a gardening center you trust. Make sure the leaves are a healthy green color, without any dryness, yellowing, or pests. Pick out plants that have lots of budding but are not flowering yet. Geraniums do well in multi-purpose compost or potting soil that contains a mixture of perlite, vermiculite, and sand. They prefer light, well-drained soil, and most potting soils available commercially will do the trick. Many gardeners make the mistake of over-watering their geraniums. This can cause yellowing. It’s much better to allow the soil to completely dry out. Then give it a deep watering (preferably in the morning) until the soil is damp once again. Use a slow-release fertilizer right after you plant your geraniums and then again in a few weeks. Don’t over-fertilize, thinking that this will give you bigger blooms. Always follow the directions on the package. Don’t leave dead foliage on your plants. 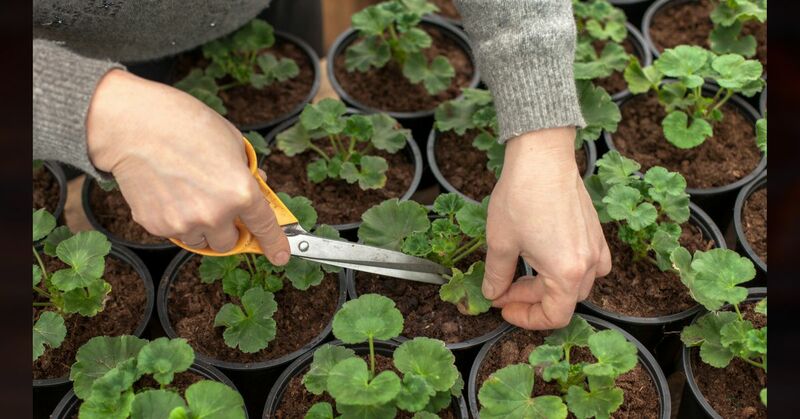 Deadhead them (pinch off or cut) so that your geraniums remain healthy and continue to create new blooms.